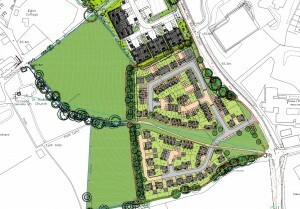 Revised plans to build a housing estate off Bickland Water Road in Falmouth were rejected by a Cornwall Council planning committee this week by 11 votes to 2 with one abstention. In a report prepared by Cornwall Council’s planning officer, the new submission, which reduced the number of houses from 153 to 94 and included a landscaped corridor to maintain views of Budock Church in the distance, was recommended for approval. Councillors raised concerns about the road junction at the proposed site believing it to be on a dangerous bend and that schools in the area were nearly full to capacity. There were also concerns about drainage and flooding with a recent photograph of the site known as Bull Field showing it to be waterlogged after the recent rain. In addition, it was raised that the development would cause the loss of greenfield separation between Falmouth and Budock Water village.